Baptism: Doorway to the Life of Grace! Baptism is frequently referred to as the “gateway” to life in the Spirit, and the door to the other Sacraments. The Sacrament of Baptism cleanses us from original sin, incorporates us into God’s family, and makes us sharers of His divine life. The Church urges parents to see to the baptism of their children as soon as possible after their birth. The baptism of children is based upon the faith of the parents and godparents. In order for parents and godparents to have some understanding of the sacrament and to know their responsibilities, we ask them to participate in baptismal instruction. Baptismal preparation classes at St. Pius X are held on the 1st Saturday of each month in CC #2 at 10:00 a.m. Both the parents who wish to have their child baptized, as well as the godparents, are asked to attend a baptismal preparation class. Baptisms are celebrated on the 3rd Sunday of each month at 1:30 p.m. in the church. However, a baptism celebration may be scheduled at another time by arranging this with one of the priests or deacons. · It is necessary for parents of the children to be baptized to be registered in the parish and regularly practicing their Catholic faith, including attendance at Sunday Mass and living according to the teachings of the Catholic Church. If not, they must have a willingness to do so. They need to also assure that their child is raised and educated in the Catholic Faith and that the child will receive the Sacraments of Confirmation and Holy Eucharist in the future. In other words, there should be reasonable hope that the child will be raised in the life of faith. · Parents who belong to another parish may also have their child baptized at St. Pius X, but they will need to obtain a letter of permission from their pastor to have their child baptized at St. Pius X. Also, if parents attend a class elsewhere, a letter verifying class attendance should be presented prior to the baptism. · Parents and godparents need to register for and attend the baptismal preparation class. Please contact the parish office at (361) 993-4053 to register prior to attending the class. The registration form can be found here. · A copy of the child’s birth certificate (Bureau of Vital Statistics) will need to be provided to assure that all information is recorded properly. · For baptism, a minimum of one godparent is required, and at least one godparent needs to be Catholic. If there are two godparents, they must be one man and one woman. · The godparent(s) must be attending Mass on Sundays on a regular basis. · Godparents must be at least 16 years old and have received the Sacraments of Baptism, Confirmation, and First Eucharist. · If married, godparents must be married in the Catholic Church. · If single, the godparent must not be living with someone with whom they are not married. · Godparents need to be in good standing with the Church. 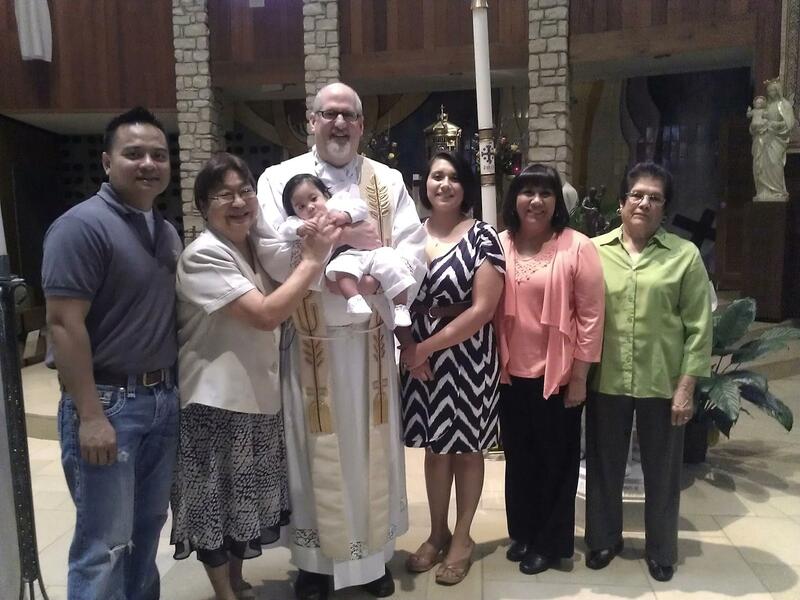 · Each godparent should attend a baptismal instruction class prior to the baptism. · If from another parish, godparents should bring a letter verifying that they have attended baptismal instructions in their parish if they do not attend class at St. Pius X. · Because godparents, by their own example, act as a witness to the Catholic Faith, a non-Catholic is not able to be a godparent. However, if a person is living his or her own Christian faith, he or she can stand with the godparent as a “Christian Witness” to the baptism. If you need more information, please contact the parish office. We would be more than happy to assist you! Once a child has reached the age of 7 years old, he or she is considered to be of “catechetical age” and is able to comprehend and learn the Catholic Faith and the meaning of the sacraments. Therefore, the child is enrolled in the religious education program with the appropriate age group where he or she will receive instruction for the Sacraments of Baptism, Confirmation, and Holy Eucharist. These children normally receive their sacraments at the Easter Vigil Mass prior to Easter Sunday. See the Religious Education page.